This view of Sydney Tower, rising above the Sheraton Hotel and the J.P. Morgan office building, is from Hyde Park North. Sydney Tower was completed in 1981 and is still Sydney's tallest structure standing at 309 metres tall. The observation deck and revolving restaurant at the top stand above Westfield Sydney shopping centre, previously known as Centrepoint. A familiar, unique landmark in Sydney. Great perspective. I married a Sydneysider in 1970, just before the tower was designed and built. I never liked sky scrapers because they blocked the sky, but this tower always appeared to me to be slim, elegant and streamlined. Well done! How do you get up there? Is the bottom part the elevator? Jenna, the tower sits above a shopping centre called Centrepoint. The tower and revolving restaurant can be accessed by elevator/lift from the shopping centre. Hmm, can't see it. Sounds pretty cool though. Jeanna, the shopping centre is out of shot, below the tower. 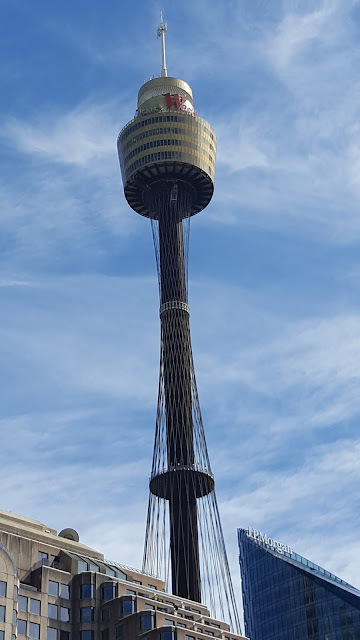 If you click on the Sydney Tower link, you can see some of my previous photos including some with the shopping centre in view. Great shot of the tower against the sky. that's 1000 feet - have you eaten up there? And does the restaurant turn? Joanna, yes I have eaten at the restaurant and it does revolve. They have some exotic Australian cuisine including kangaroo, emu and crocodile. Ohhh nooo, Jim, eating emu while revolving in the middle of the sky! Hello, nice view of the tower. Happy Friday, enjoy your weekend! Beautiful pointer to a beautiful sky. That's rather neat how it looks tethered to the ground!